Yesterday was one of those days when trying to fix myself anything to eat or drink was an exercise in futility. I set out lavender buds to make myself some lavender mint tea, only it didn’t get made until this morning. I put bulgur wheat in a bowl to soak and planned to chop parsley so that I could have tabbouleh for lunch. The bulgur wheat soaked for longer than the usual 30 minutes before I got back to it, and my beloved tabbouleh turned into a midnight snack as I didn’t even get to chop the parsley until 11:30 pm. Yes, the boys keep me busy, especially with making the commute to take them to preschool in the afternoons. I spend over two hours on the road every day driving them back and forth to school, most of the time with music playing and my oldest singing with great enthusiasm at the top of his lungs. Tackling anything other than cleaning up dishes after meals happens after everyone goes to bed at night, and I’m often up very late, which isn’t so fun since I’m not a night person. My mother used to do the same thing when I was growing up, and I seem to be traveling the same path. This morning my notorious early risers didn’t wake up until 8 am, and I allowed myself the luxury of sleeping in, something that never happens on the weekdays. They even played quietly after breakfast, and I finally made myself a cup of tea using the mint from my kitchen garden and lavender buds that I purchased from Blue Moon Lavender via Local Harvest, a great site for finding local sources of many farm products. Technically a beverage made with herbs is an infusion, not tea, but I wasn’t too worried about semantics this morning. I just enjoyed a few quiet moments sipping my hot tea, thanking my lucky stars that the boys had slept late. The tea was fragrant and had a slight sweetness, so I drank it without any honey and just enjoyed the fragrance and flavor as they were. My kitchen herb garden is starting to produce some seedlings, but the pickings are slim as the only herb ready for harvesting is my mint. Hopefully I’ll have some more herbs to work with in a few weeks. 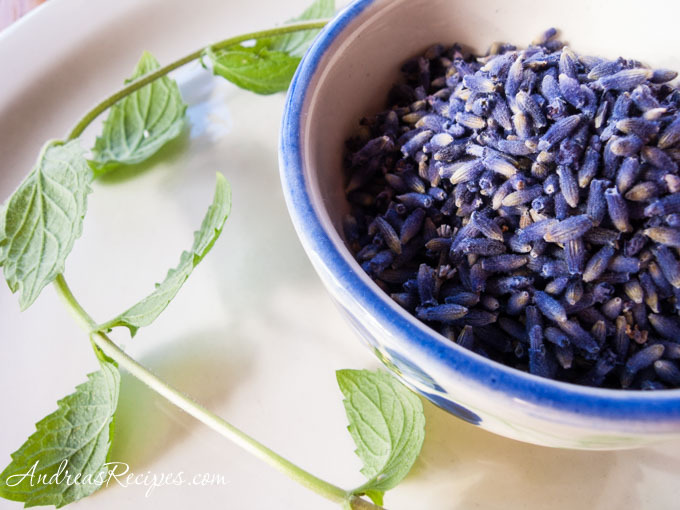 I’ve toyed with the idea of growing my own culinary lavender, and Blue Moon Lavender sells seeds, so I might just go for it. This is my contribution to this month’s Grow Your Own event. The round-up will be posted this Saturday, so get those entries in if you haven’t already. Put the mint and lavender flowers in the tea pot and add the hot water. Steep for 3 to 5 minutes. Pour through a fine mesh strainer into tea cups. Serve hot with honey and lemon as desired. I love lavender teas, I usually share a cup of an afternoon tea with my friend who works as a Poulsbo florist. I was waiting for the GO on GYO!!! Will post a recipe! Have a lovely day, the seeds are so beautiful! I love anything with lavender it is so calming. Beautiful pictures. And it sounds terrific. Nice photo! I’ve never thought of a mint-lavender combination for tea but it should be interesting. Andrea, what a lovely blog! It’s my first time here – I had a great time reading through your posts and recipes. this is wonderful. thanks. i’m going to make this. Now that I know about your Grow Your Own event, I’ll have to submit that for next month’s GYO. Lovely! I love lavender but have never tried it in a tea – which is pretty surprising as I’m something of a tea obsessive! (http://afternoonteatotal.blogspot.com). I’m not sure if the English Lavender that I grow would work. What sort of lavender seeds were you using? Hi Natalie. The stash I get from Blue Moon Lavender is Lavandula angustifolia Royal Purple, and I like how it complements the mint.